Another day, another smoothie. 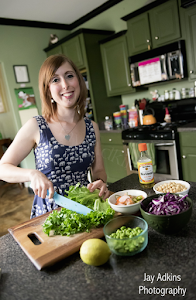 I'm on day 12 of the No Meat Athlete Marathon Road Map meal plan, and my race — my third marathon — is just two days away!! I'm ready and not ready at the same time. Does that make sense? I'd like to say I stuck to the plan all day, but that's a lie! I had an unexpected (and delicious) deviation today. But more on that in a few. 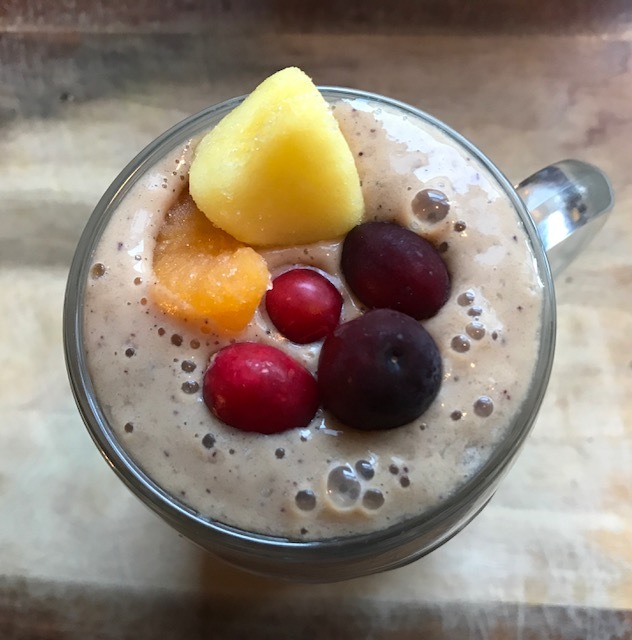 My morning started with — yep — a smoothie! After a 2-mile shakeout run, my last run before the race. I'm taking Friday off to rest my legs. Today's smoothie was ugly but tasty. 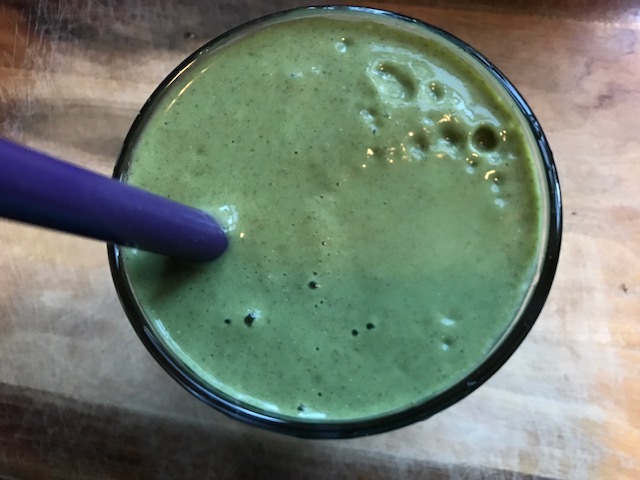 Banana, strawberry, almond-cashew milk, hemp protein powder, sunflower seed butter, and kale powder. Morning snack was Veggies & Hummus. I went with carrots and celery with Trader Joe's Spicy Hummus Dip. ... WE ALSO HAD CAKE. VEGAN CAKE. Every month, we celebrate staffers' birthdays, and we have a number of vegan/vegetarian folks. This month, we had two vegetarians (one who doesn't do dairy and another who is on-again/off-again vegan), so there were TWO VEGAN CAKES from Muddy's Bake Shop. I can't turn down vegan cake, meal plan or no. I chose a slice of the Chocolate Mint Cake. And it was so drool-worthy. I didn't realize that I'd missed sugar until I took a bite. That said, about 15 minutes after consuming the cake, I started to feel pretty gross. 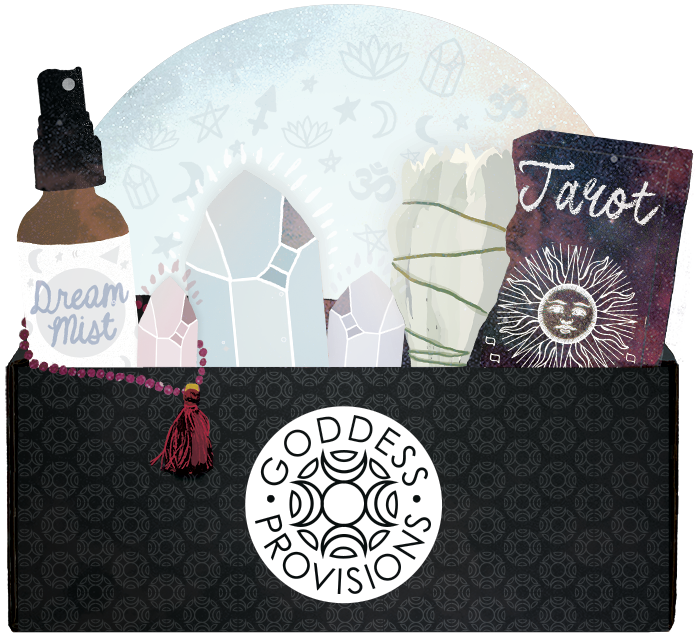 I felt sluggish, and then I got a headache. I know it's just because I've been eating so well for so many days, and adding all that sugar was a shock to my system. No regrets though. It was delicious, and the bad feels passed. I brought my afternoon snack salad to work, and eating that definitely helped with the sugar crash. Raw veggies cancel out cake hangovers, right? 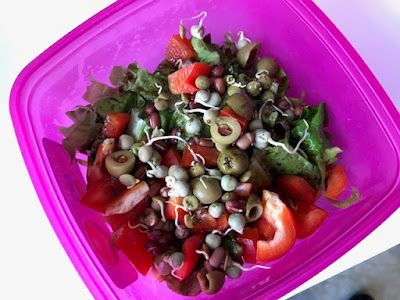 This simple salad had bell pepper, sprouts, green olives, and French vinaigrette. After work, I headed straight to the St. Jude Marathon race expo to pick up my bib! I'm going back tomorrow with Paul to get his bib (he's running the 5K), but I was eager to get my stuff asap. Then I ate my dinner at home before heading to a friend's house. Tonight's meal was Sweet Potato Curry with tofu, Thai red curry paste, steamed bok choy, and brown rice. I feel like this also helped erase my cake hangover. And look at that beautiful bok choy flower! 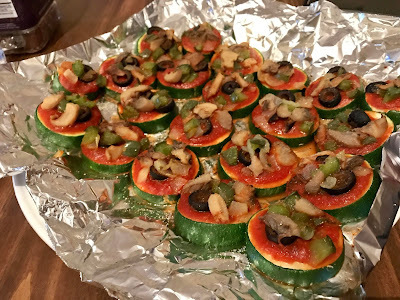 I hadn't planned on eating anything else, but when I got to my friend Shara's house for girl's night, she'd made Vegan Zucchini Pizza Bites. These are so good, and I feel good when I eat them — lots of them. She bakes zuke slices topped with marinara, olives, mushrooms, onions, and peppers. I'll be back on Sunday with a full race recap! Y'all wish me luck! 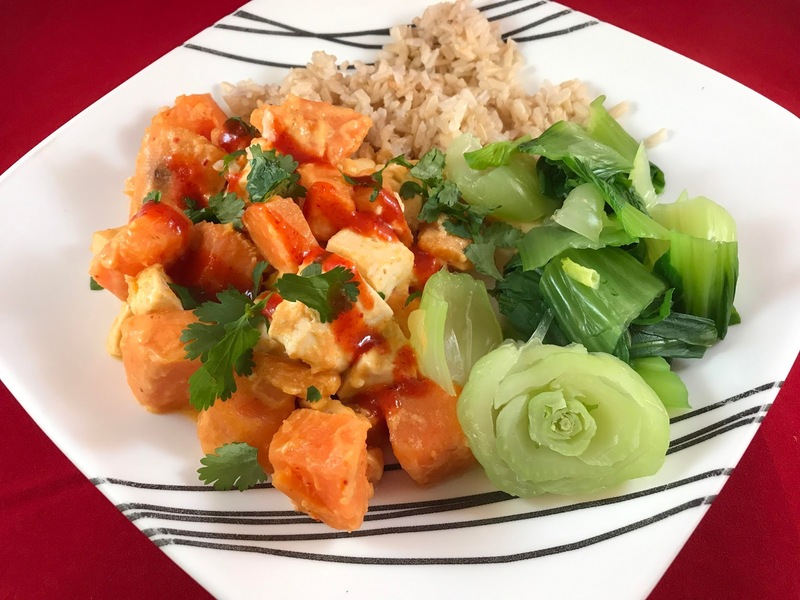 I'm on day 10 of my two-week meal plan from the No Meat Athlete Marathon Road Map. 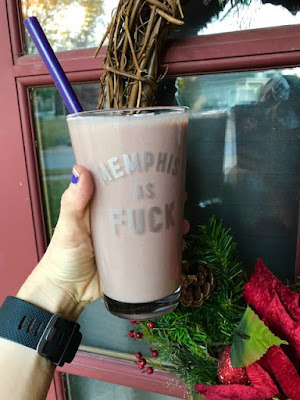 It's a whole foods-based plan designed for athletes, and I'm hoping it helps me fuel properly for this Saturday's St. Jude Memphis Marathon (my third 26.2!). My morning started with a 4-mile run, the longest run this week since I'm tapering for Saturday. Then I had an Orange Cranberry Vanilla Protein Smoothie. This may be my new fave protein shake! 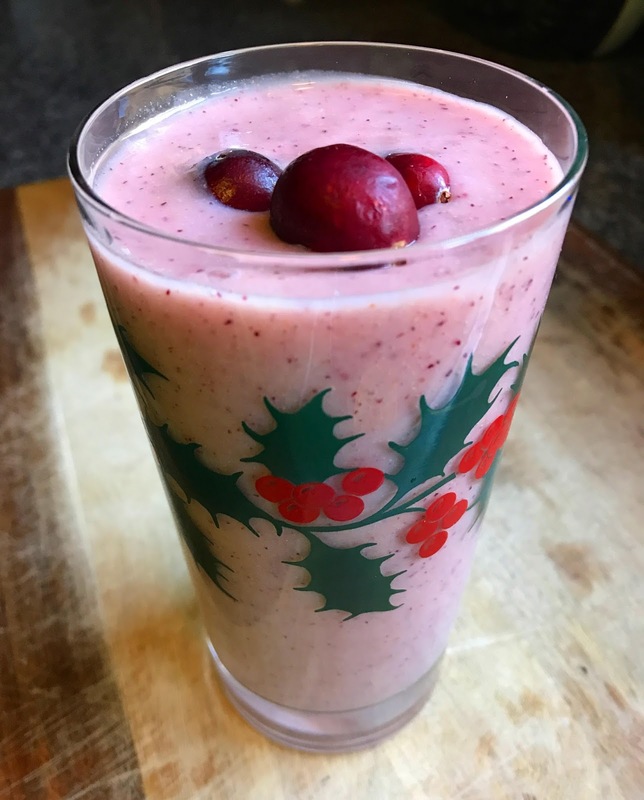 I used a frozen mandarin orange-pineapple-papaya blend with fresh cranberries, banana, almond-cashew milk, hemp seeds, vanilla protein powder, and a little carrot juice powder. Like an orange creamsicle with a slight tartness from the berries! 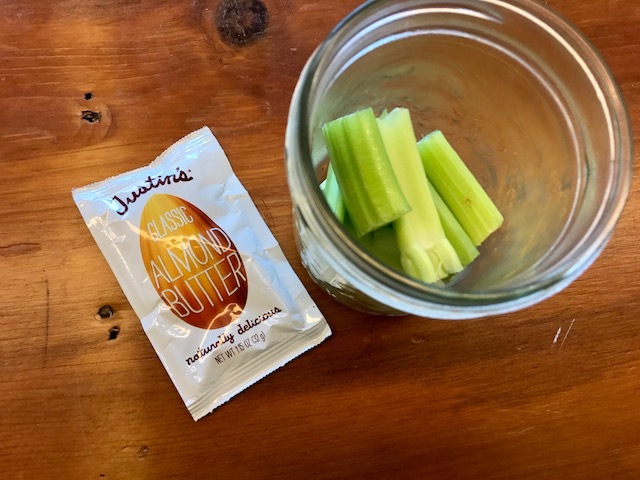 Morning snack at my desk was Celery with Almond Butter. I keep these little packets around for on-the-go snacks. So handy! Lunch was leftovers from yesterday — Lemony Lentils with Caramelized Onions & Brown Rice. Not pretty. Looks like dog food. But tastes amazing. I had a few squares of Endangered Species Cranberry Almond Chocolate at my desk in the afternoon because I got a craving. 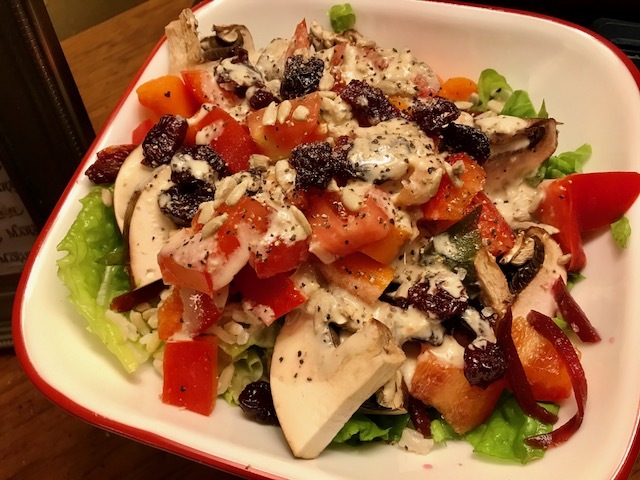 For my afternoon snack, I had a salad with lettuce, mushrooms, bell pepper, carrots, brown rice, dried cherries, beets, sunflower seeds, nooch and a tahini-ginger dressing. Every afternoon on the plan includes a salad, which is perfect for tiding me over through post-work meetings or prepping dinner. Tonight, I had a Friends for Life board meeting at 6 pm, so I had my salad first. I was hoping this would tide me over, but the meeting ran long, and I was famished when I got home around 8 pm. 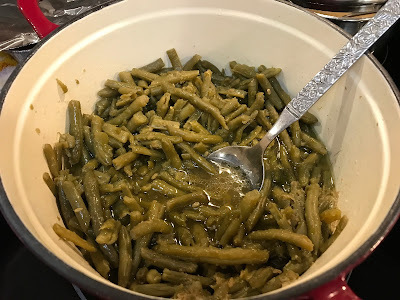 Dinner was most already prepped, but I had to wait for my potatoes to cook in the air fryer, so I shoved a spoonful of SunButter sunflower seed butter in my mouth. No shame. Dinner was awesome though and worth the wait. 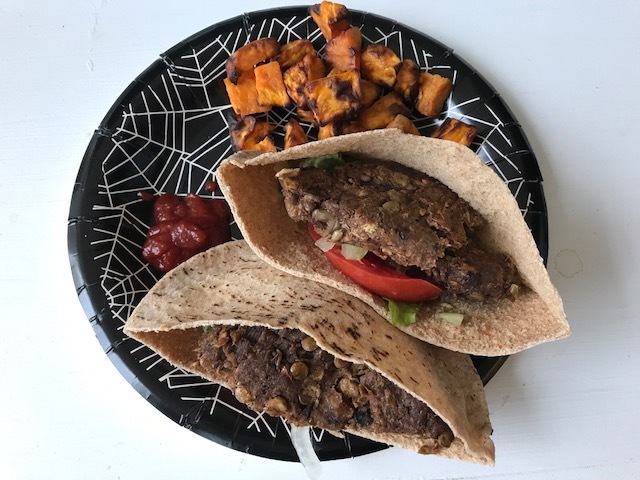 We had No Meat Athlete Veggie Burgers in Sprouted Grain Pita with a side of Roasted Sweet Potatoes. 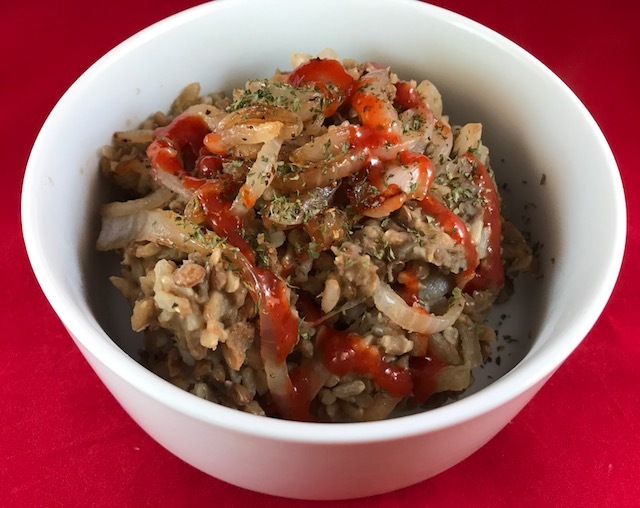 The burgers (recipe is included in the Marathon Road Map plan) are made from lentils, walnuts, mushrooms, onions, garlic, and wheat gluten. They're bursting with flavor and perfect on a little pita with lettuce, tomato, and onion. Paul didn't like the burgers, but he's liked most everything else on the plan so far. He likes super-textured plant meat burgers, and these were softer veggie burgers. Oh well! More for me. I froze four of the leftover patties for quick dinners later in the month. The meal plan didn't call for a side, but burgers need potatoes if you ask me. I tossed some cubed sweet potatoes in a little olive oil and air-fried until crisp. YUM. My marathon is less than a week away! 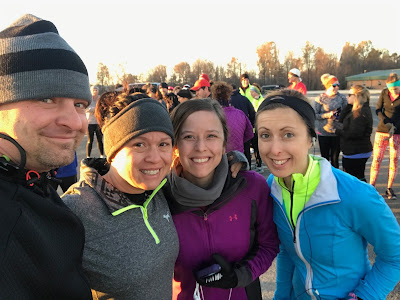 On Saturday, December 2, I'll be running 26.2 miles for the third time at the St. Jude Memphis Marathon, which weaves through downtown and Midtown Memphis (right past my office at Crosstown Concourse and through many of my friends' neighborhoods). To prepare, I've been doing a two-week meal plan using the sample plan in No Meat Athlete's Marathon Road Map (which also contains the 18-week training plan I'm using). Today started just as the last 8 days have — with a smoothie. I went on an easy 3-miler right after I woke up. It's taper week, which means I'm ramping down my mileage considerably. And then I had a smoothie. Today, that was a Strawberry-Coconut PB&J Smoothie with strawberries, banana, PB2, coconut-almond Vega Protein & Greens powder, almond-cashew milk, rolled oats, and flax seed. Super thick and filling and quite lovely in my Memphis AF glass. I had to speak on a panel about PR careers for a class of communication students at the University of Memphis around lunch time, so I postponed my morning snack and had an early lunch of leftover Pasta with Roasted Tomatoes & Chickpeas at my desk. This was last night's dinner, and it was much prettier then. But still tasty today. Since I ate lunch at 11 am, I was pretty hungry again before I got off work at 5 pm, so I had my morning snack on the plan in the afternoon (around 3:30 pm). This was a fun one — Avocado with Lemon & Pink Salt. 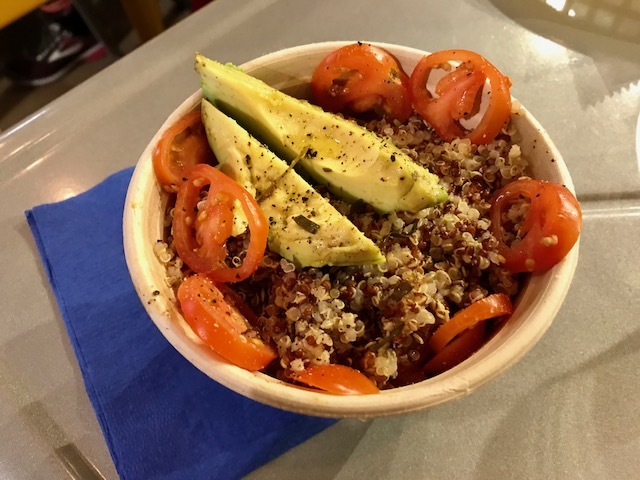 I'll take any excuse to eat an entire avocado with a spoon. My usual afternoon snack on the plan is a salad, and I didn't skip that! 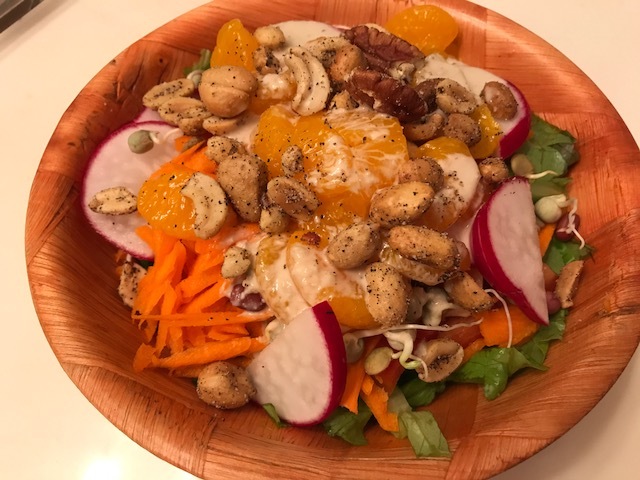 I love snacking on salad while I'm fixing dinner. 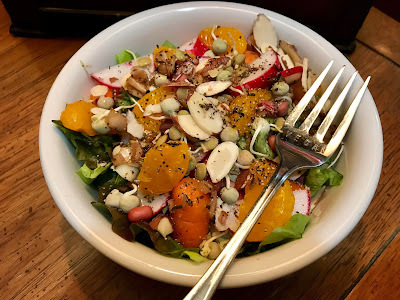 Tonight's salad had baby spinach, grated carrot, radish, crunchy sprouts, cucumber, and mushroom. Since I had that super-fatty avocado earlier (good fat, I know! ), I was craving a lighter dressing so I went with Spicy Hummus Dip and Salsa rather than an oil- or nut-based dressing. Dinner was Lemony Lentil with Caramelized Onions & Rice. This was an easy, humble dish of lentils cooked with brown rice (in the same pot) and dressed up with a little lemon and some onions. Not the prettiest dish, but tasty and very satisfying. Of course I added sriracha! I'm allowing some alcohol on the plan because the idea isn't for me to exclude things from my diet but rather to focus most of my days on eating the healthiest foods I can for fueling my running. Also, Matt from No Meat Athlete talks a lot about how his nightly "dessert" is usually a beer or glass of red wine. Tonight, I opened some red wine to make tomorrow night's veggie burgers (more on those tomorrow! ), so I had a glass as a little nightcap. I mean, who can actually open a new bottle of wine and not indulge, right? I always celebrate my veganaversary on Black Friday since I went vegetarian on that day in 1994 and vegan on that day in 2004. Of course, the date of Black Friday changes from year to year, but it's just easier for me to remember that way. 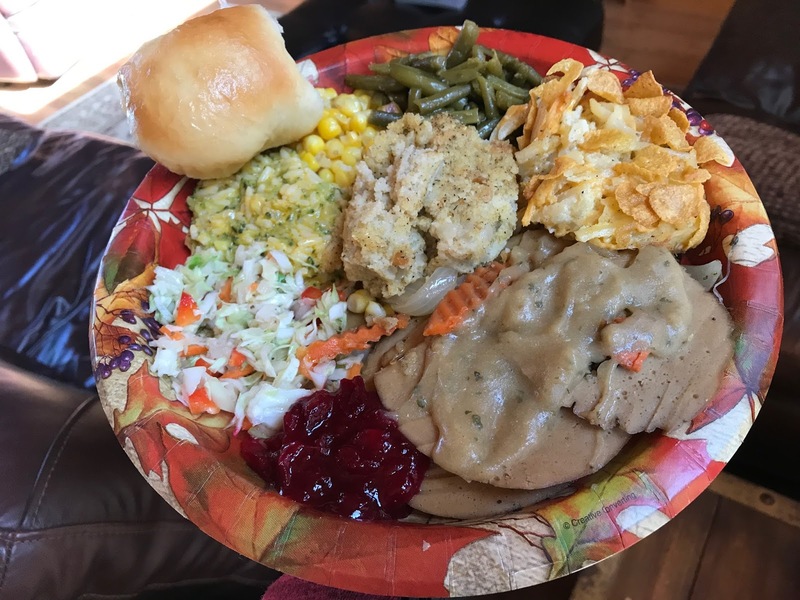 I'm doing this two-week No Meat Athlete Marathon Road Map meal plan to prep for my marathon next weekend, but I decided before I started it that I'd take off the meal plan on Thanksgiving and Black Friday. Except I did start my Friday with a smoothie, as the plan calls for, to make sure I got a few nutrients in before another day of gluttony. 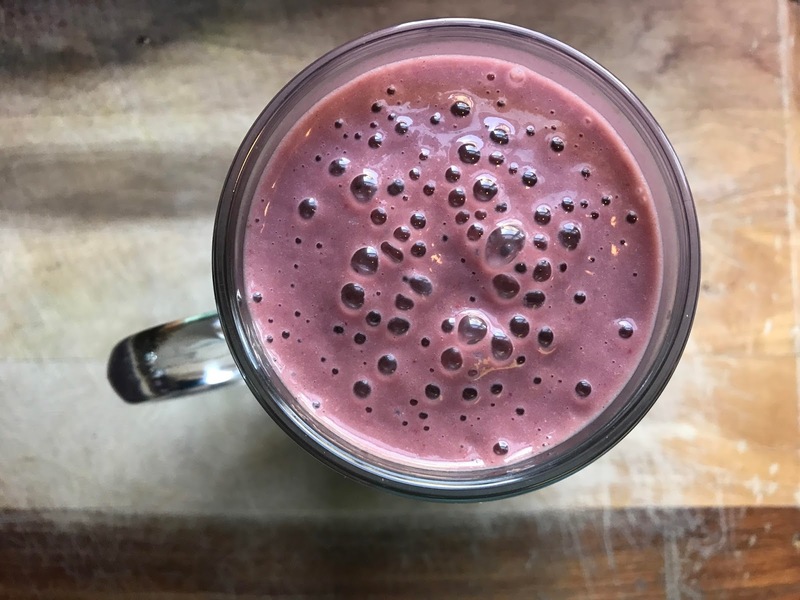 I made the Everyday Double Berry Banana Smoothie from the No Meat Athlete Cookbook. This had banana, strawberry, blackberries, green leaf lettuce, flax seed, and walnuts. I had that smoothie to tide me over before my big lunch. Every Black Friday begins with brunch at Brother Juniper's with my mom. 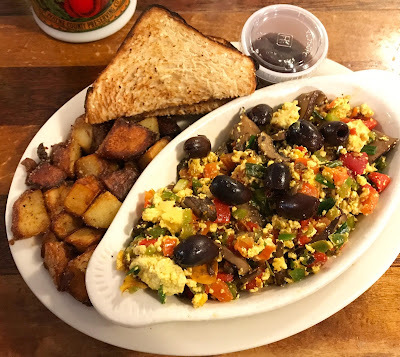 She comes over to shop with me on Black Friday, and we fuel up with Tofu Scramble, Toast & Jam, and Home Fries. We've been doing this for YEARS. It's the perfect start my veganaversary, which, by the way, counts 13 years vegan/23 years vegetarian this year. After brunch, we hit the Tanger Outlets mall to grab some Christmas gifts for ourselves and Paul and my dad. My mom headed back to Jonesboro, and I heated up a plate of Thanksgiving Leftovers! It may not be as pretty as the original plate, but I think the leftovers plate tastes even better. 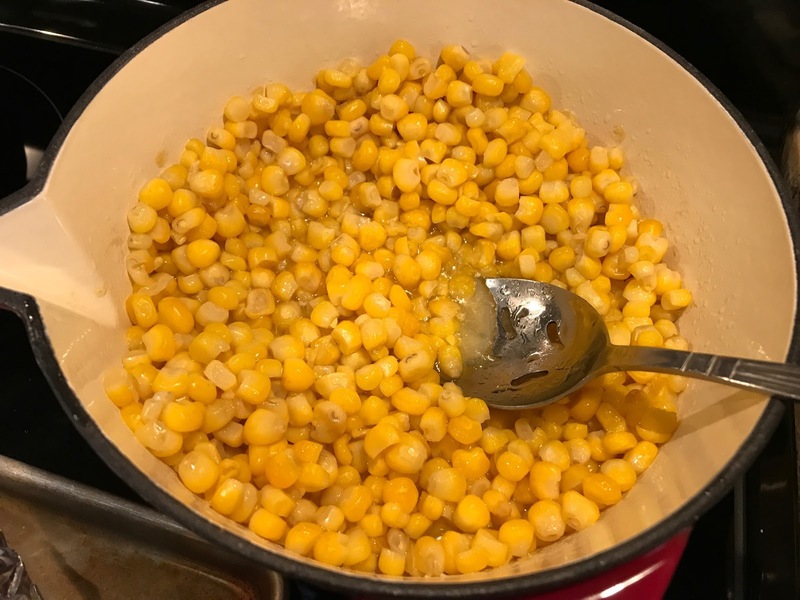 I usually have Thanksgiving leftovers for DAYS, but this year, I was eager to get back on my meal plan. So I froze what was leftover after Friday night. 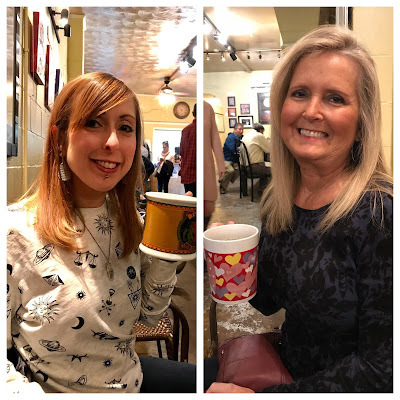 After dinner on Friday, some friends and I went to Railgarten to see our favorite local aristocrunk group, Lord T & Eloise, and I had a few beers. But on Saturday morning, I was right back on the plan with another Everyday Double Berry Banana Smoothie only with wheatgrass this time, hence the change in color. 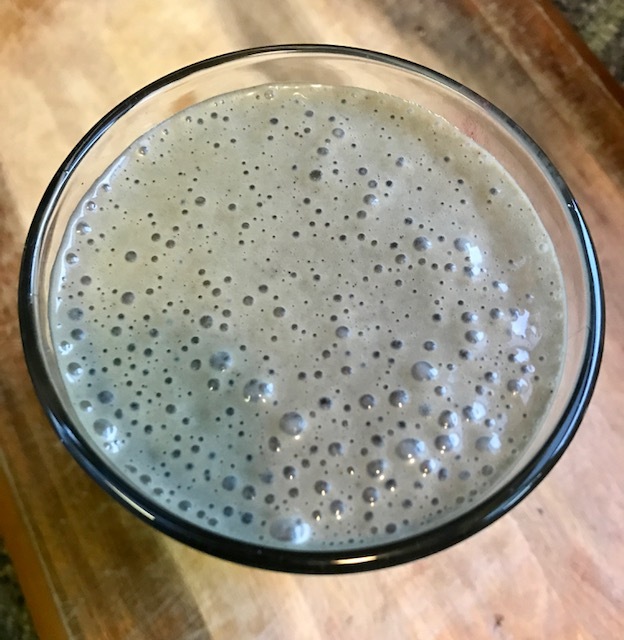 I had this before my 10-mile training run — my last long run before the marathon. 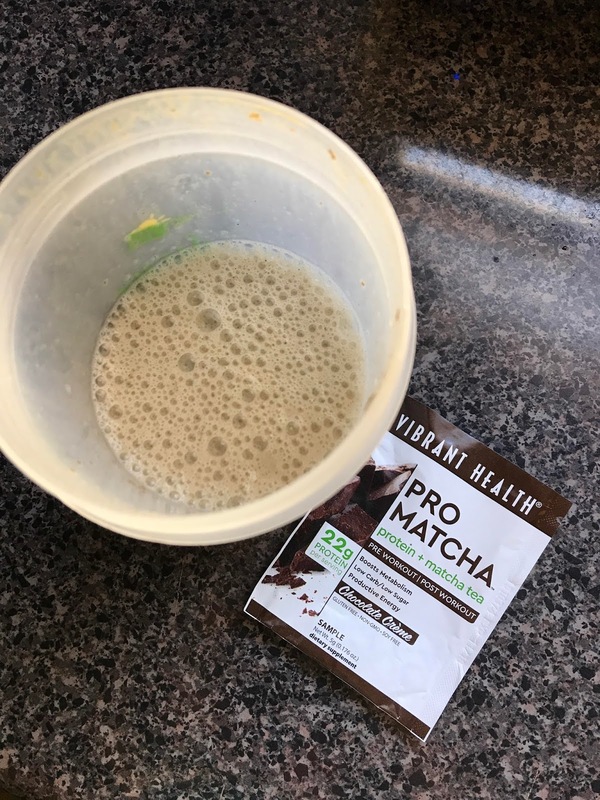 After my run, I had a quick protein shake with almond-cashew milk and Vibrant Health matcha chocolate creme protein powder. 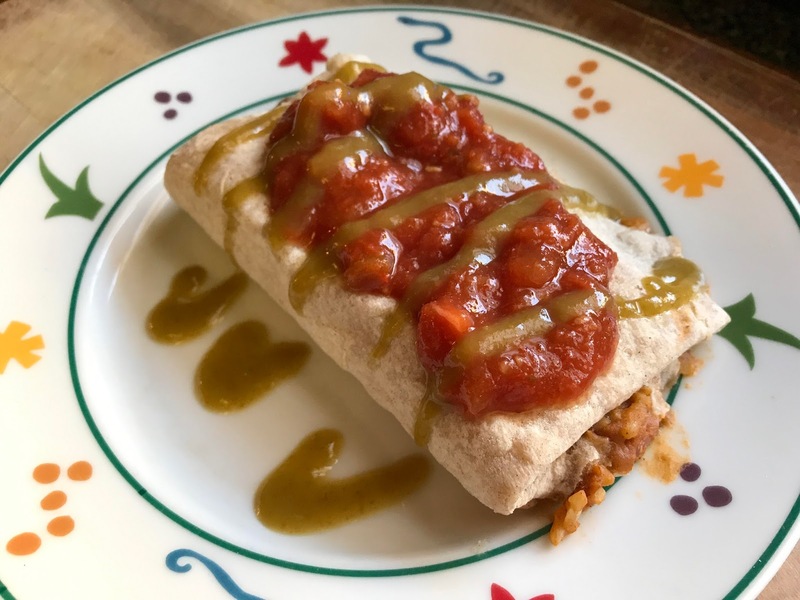 Then it was time for my morning snack on the meal plan — a frozen Amy's Bean & Rice Burrito! Yes, that's right. My meal plan called for a frozen burrito, and who am I to argue with that?? 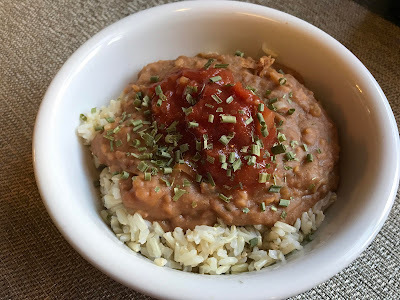 Weirdly, the meal called for a very similar lunch of Rice & Beans with Salsa. I used a can of Trader Joe's salsa-style refried beans, brown rice, and mild salsa. It was pretty much like eating another burrito, but again, who am I to argue? You can never go wrong with rice and beans. Afternoon snacks on the plan are always salads, and you get to build your own. Saturday's salad had green leaf lettuce, mandarin oranges, radish, baby carrots, sliced almonds, crunchy sprouts, and french vinaigrette. And finally, Saturday's dinner! 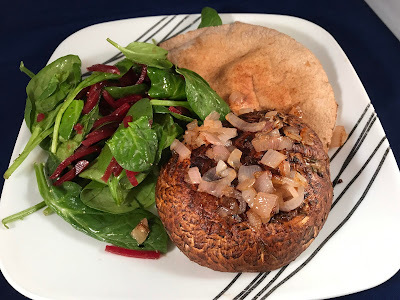 This was a super-impressive looking plate with a Grilled Portabella with Caramelized Shallots, Grilled Sprouted Grain Pita, & Spinach-Beet Salad. I loved this meal. Typically, I would eat a portabella on a bun, but it was more fun to eat steak-style. Plus, it had an awesome Dijon-worcestershire marinade that gave it a fancy flavor. I opted to stay in Saturday night, which is rare. That's usually my going-out night, but we partied pretty hard the night before at Railgarten. So I watched the Walking Dead in my bed with Polaris, while Paul watched TV in the living room. 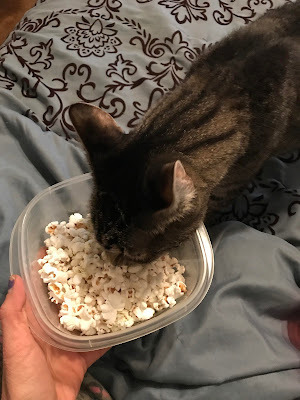 I snacked on some coconut oil-popped Popcorn with Sea Salt. Polaris helped me eat it! Just kidding — I only let him have one bite, but he does love popcorn. Sunday morning started with another smoothie. This time, I made a holiday-themed Cran-Apple Smoothie with frozen cranberries, apple, banana, flax seed, white beans, and ginger. Excited to finally use my vintage holiday glasses! Morning snack today was a Sprout Sandwich — crunchy sprouts (my fave kind! 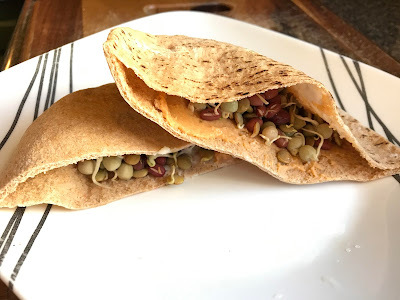 ), hummus, garlic spread, and lemon juice in a sprouted grain pita. I had this while cleaning the house. Lunch on the plan was supposed to be leftovers of yesterday's portabella mushrooms. But since I'd skipped a meal on the plan over Thanksgiving, I wanted to try that recipes that I'd missed. So I decided to save my leftover 'bella mushroom for my afternoon salad and make the Seared Tofu & Broccoli for lunch. 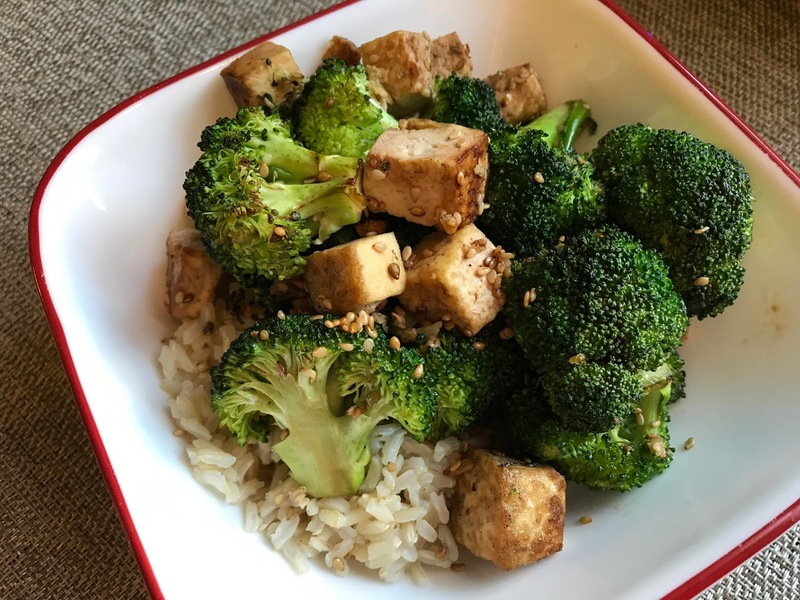 This was a simple and yummy dish of sauteed tofu, broccoli, and sesame seeds with a little soy sauce, served over rice. 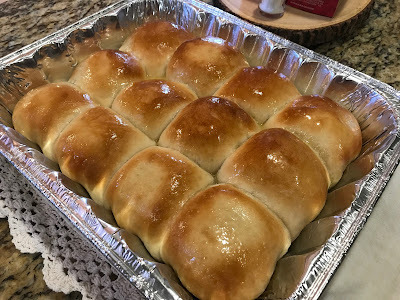 Easy to make, yummy to eat. 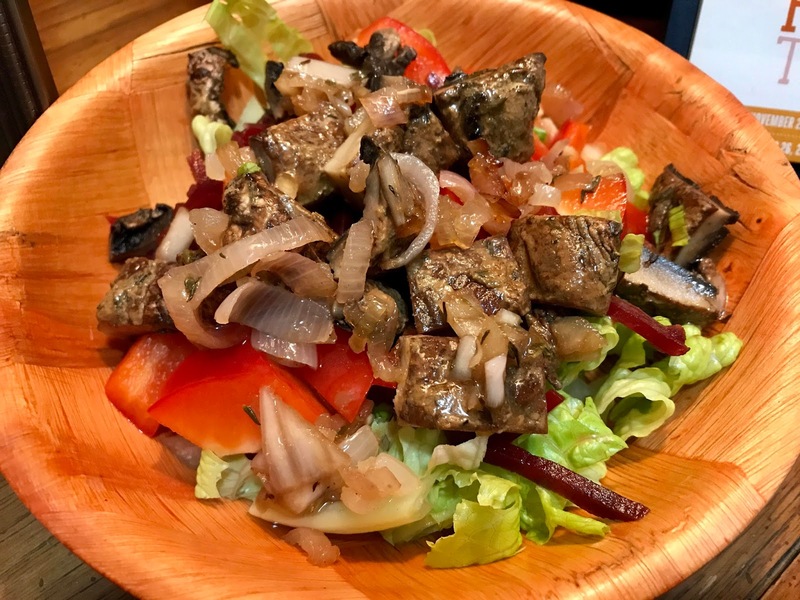 I used my portabella and leftover shallots for my afternoon salad, which I dressed with french vinaigrette. And dinner was an awesome dish of Pasta with Roasted Tomatoes & Chickpeas. 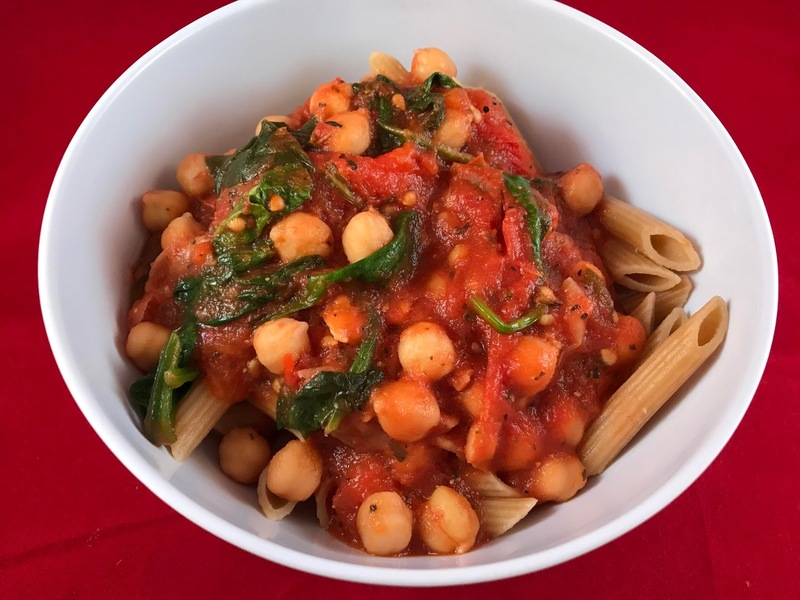 I slow-roasted tomatoes with garlic and herbs and then tossed those with cooked chickpeas, spinach, tomato sauce, and whole wheat pasta. Definitely one of my fave meals on the plan so far! Whew! What a yummy weekend! See y'all tomorrow. Thanksgiving is my favorite holiday! Mostly because of my mama's dressin' and hash brown casserole but also just because I love to eat all the things. Gluttony is totally my jam, so I like to work up an appetite on Thanksgiving morning with a nice run. For the past couple years, Misti and I have been running with a group of folks in Paragould, a small town just outside my parents' hometown. It's an unofficial Turkey Trot that meets outside Greene County Primary School. The full group does 10 miles, but some choose to do less. 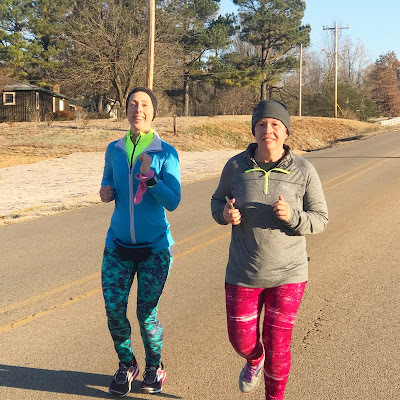 My No Meat Athlete Marathon training plan called for a 5-mile tempo run today, so Misti, her daughter Melani, Paul, and I just did 5 miles. It was so cold this morning — 30 degrees! — but we made it. 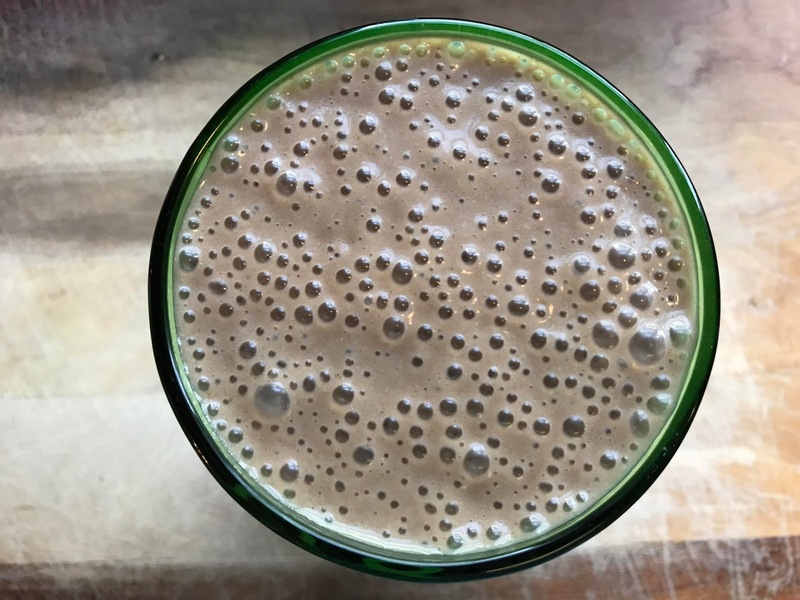 Post-run, Paul and I both had protein smoothies with chocolate hemp protein, banana, chia seed, and soymilk. 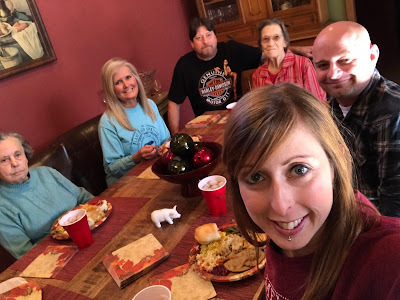 Those held us over until noon when it was time for my mama's Thanksgiving lunch! Here's my plate. I've been eating so healthily over the past few days on my No Meat Athlete meal plan, and it was fun to pile my plate full of plant meat and vegan cheesy, buttery casseroles. We have a small family, so it was just my parents, Me-Maw, Granny, and me and Paul. Here's a close-up of everything. 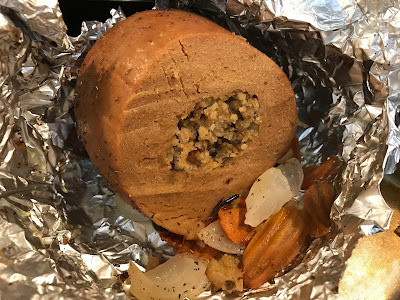 I opted for a Tofurky Roast this year. 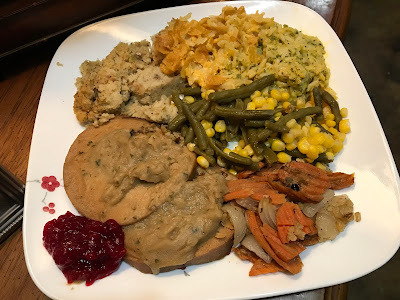 I'd planned on getting those individual Gardein turk'y cutlets (because I didn't want a ton of leftovers), but I couldn't find them anywhere. And Sprouts had Tofurky on sale, so there ya go. Honestly, I do think Tofurky really is the best plant turkey out there, taste-wise and texture-wise. 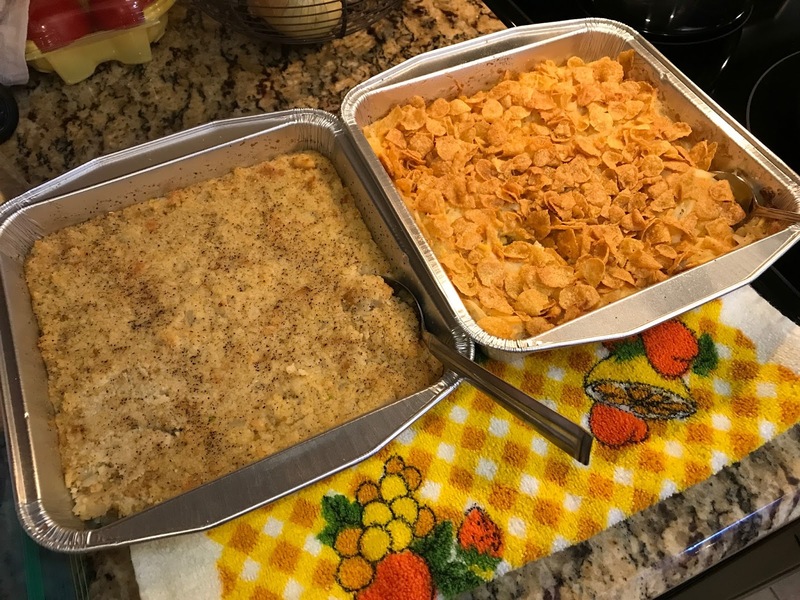 And here are the stars of the show — Mama's Cornbread Dressin' and Hash Brown Casserole. 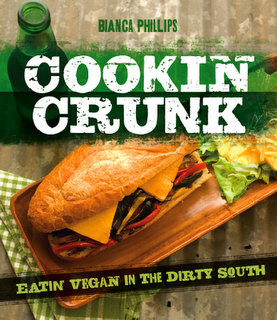 She makes vegan versions (for me!) and non-vegan versions for everyone else. I have a lot left over that I can freeze for later! She also made a Vegan Broccoli Cheese & Rice Casserole with the new Daiya cheese sauce packets. 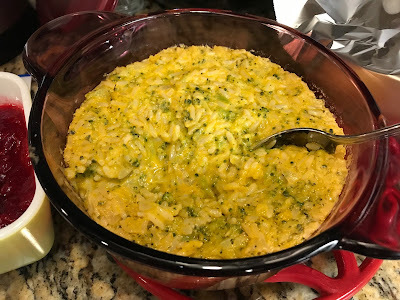 She didn't do a non-vegan version of this, so everyone ate it (and it was actually Paul's fave -- even though he claims he doesn't like vegan cheese). 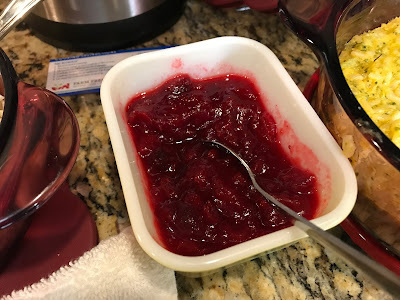 Of course, there was homemade Cranberry Sauce. 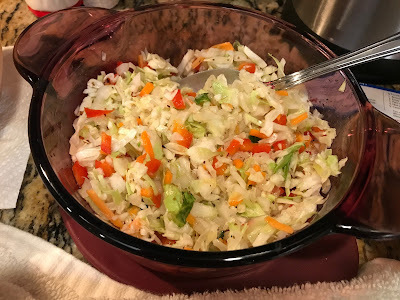 Mama always makes some sort of salad, and this year, that was a Coleslaw made with olive oil and a little sugar and salt. 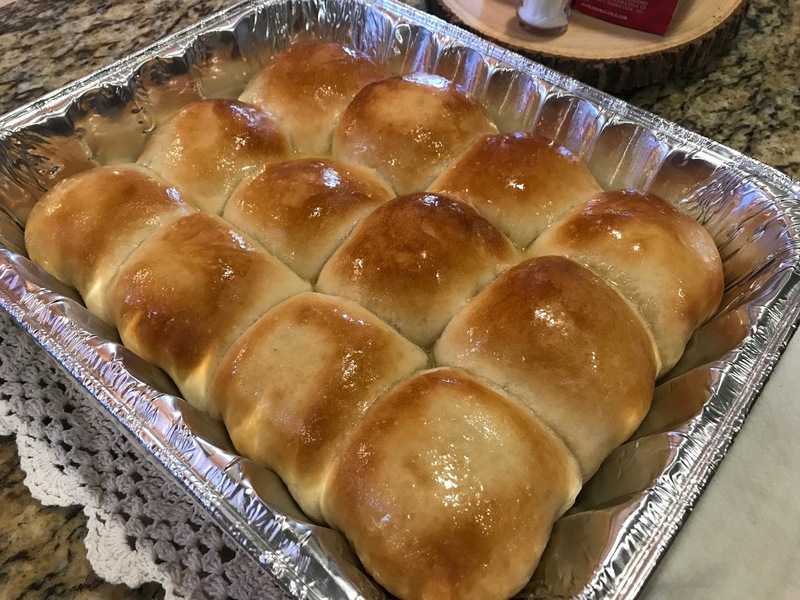 Mama said she thought she put too much Earth Balance on the Dinner Rolls. I told her there's no such thing as "too much Earth Balance." 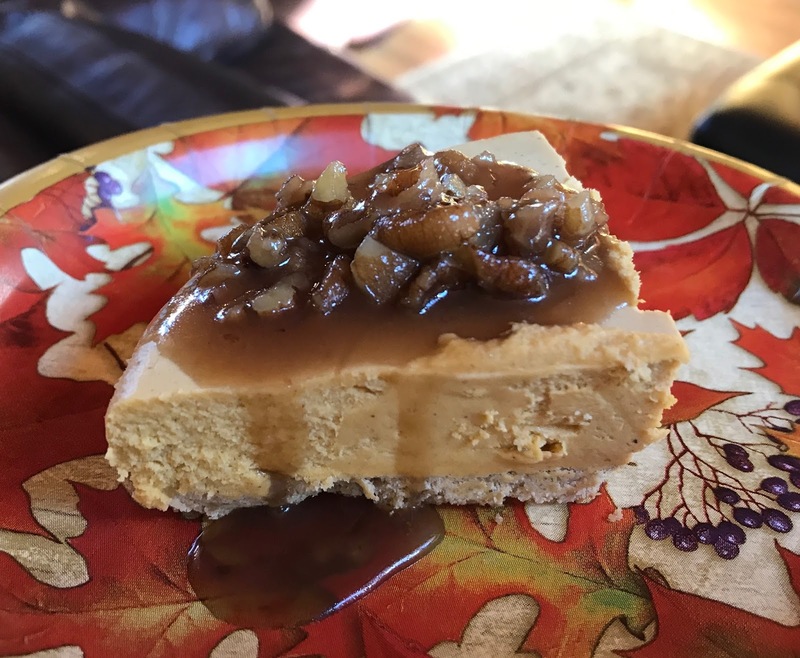 She usually makes some sort of pie for dessert, but this year, Mama already had a non-vegan turtle cheesecake in the freezer that she wanted to serve. So I picked up a Daiya Pumpkin Spice Cheesecake, and she made me a pecan praline caramel topping for it. Mmmm mmmm, y'all. This was a tasty vegan cheesecake! Paul and I drove back to Memphis in the afternoon. Once we were unpacked, we put up the holiday tree and decorations while we sipped on Cranberry Apple Moscow Mules (made with sparkling apple juice, cranberry juice, vodka, and gingerale). We had to settle for gingerale because all the stores in Midtown were closed, except for Walgreens and gas stations. Sadly, those places don't carry ginger beer. But the cocktails were still delicious! Hope y'all had a delicious Thanksgiving! !